Purchase 50 or more Universal and Mini AED Adult Training Padss and download your free support pack worth £100. Purchase 200 or more Universal and Mini AED Adult Training Padss and you can have personalised covers absolutely free! 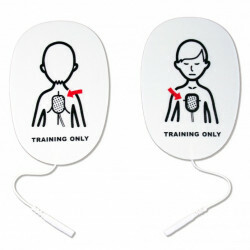 A pair of Training pads for use with the Universal AED Practi-Trainer and the Mini AED Trainer.